Home Flex Reaction – Compound 44 Give Away – Reminder! 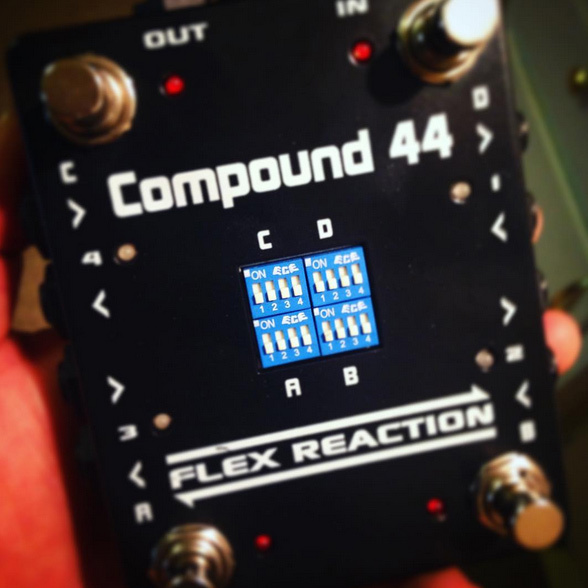 Flex Reaction – Compound 44 Give Away – Reminder! So far, the Flex Reaction Compound 44 GIve Away has been going great. I want this pedal for myself, and it makes perfect sense that you’re into it as well! In the past, I’ve used bypass loop strips and individual true bypass loop pedals. What I like about the Compound 44, is because it combines those two. The benefit, in my opinion, is to be able to provide 4 controllable loops in a small enclosure that is easily accessible and easily routable. Flex Reaction is a company making some great gear. Right now, they’re offering the Compound 44 and Compound 66 looper, but also working on a great pedalboard design called the Earth Pedalboard (which I’ll be talking about soon). Definitely check out their site for more information! Also, please take a moment to follow Flex Reaction on Facebook, Instagram and Twitter! This is a great give away! The Flex Reaction Compound 44 retails for $199! This is a great opportunity to win a very, very useful pedal for your board. This give away will run for 2 weeks (ends on 9/7 11:59PM MDT). We’re currently at the halfway point – don’t miss out on this great opportunity! Also, remember, after you submit your entry, you’ll have opportunities to gain bonus entries. Increase your odds and follow through! I would like to pause and say Thank You to you guys – for participating and being such a great community. I love talking about gear and effects because it’s fun sharing with all of you. Thank you!! Flex Reaction – Compound 44 Give Away! T-Rex Effects Replay Box Delay Give Away! Mission Engineering Delta III Distortion Give Away Darkglass Electronics Vintage Microtubes Give Away!